I noticed the images in my previous musing on decanters, Wish List Decanters, were not all working. As I fixed this, I revisited the lists of Amazon. My prize decanter is an incredibly generous gift from my parents. It's such a beautiful piece. Given this, I have to cross the other similar decanters off the list. 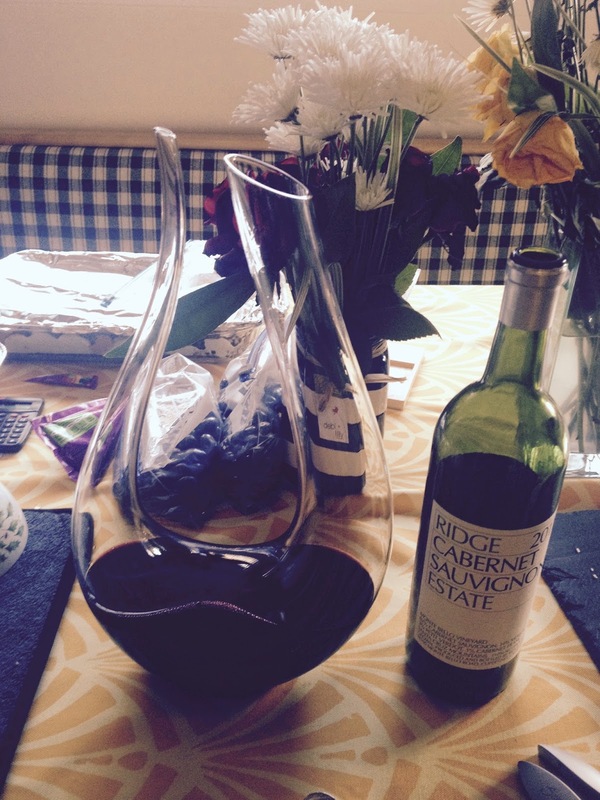 I still have an affinity for the Riedel Black Tie Bliss Decanter . It's simple, but cute. I could definitely see it enhancing a romantic evening. I also found this beauty via the also viewed section. It looks very interesting. I'm curious how it looks with wine in it. It looks gorgeous empty. What is up with this one? Wow! it is crazy expensive, and that's saying a lot given the outrageous prices of decanters. It's not on any list of mine, but it would be interesting to see it in action. Our good friends Bob and Caroline moved to the east bay last year. I have been meaning to check out Livermore Valley Wine Country for years now, but this was the catalyst I needed to get something organized. Not a lot of images on the website of the tasting room. They use Madden Ranch grapes. 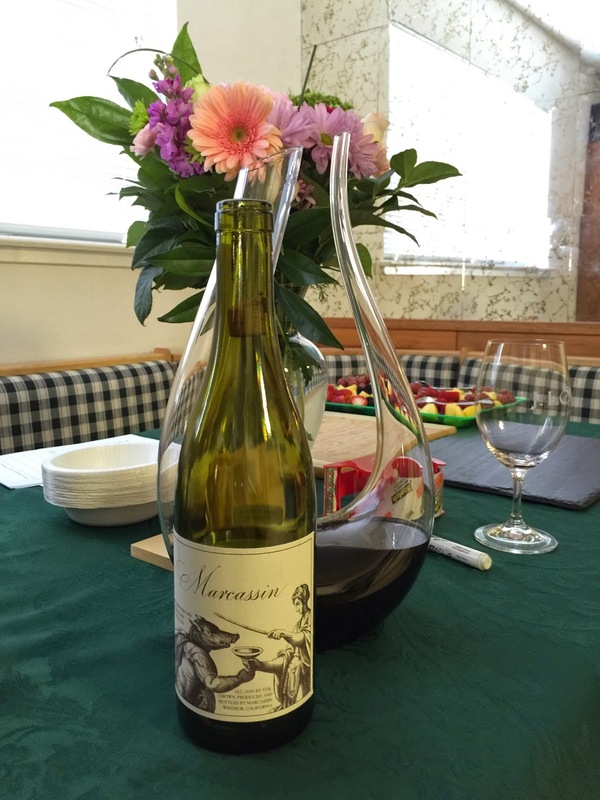 Good memories of Madden Ranch Syrah from Fleming Jenkins. These 9 wineries will need to be paired down to 3 or 4, with one audible, just in case. 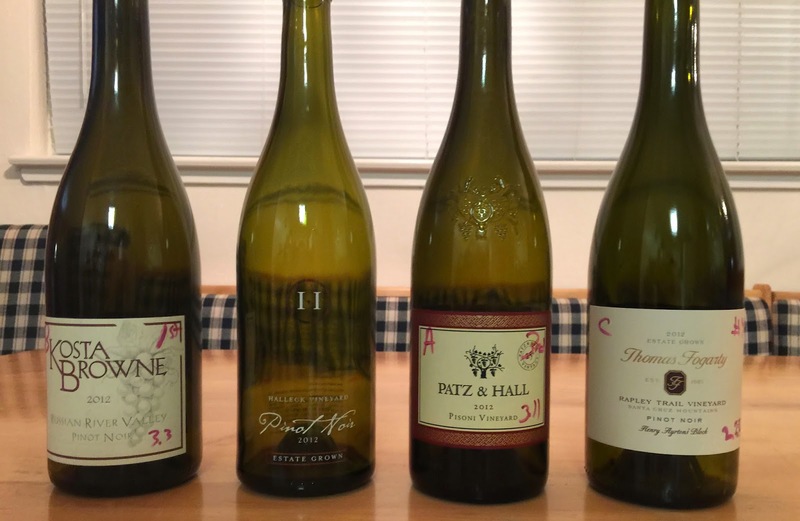 Congratulations to 2015 SF Chronicle Wine Competition, Santa Cruz Mountains AVA Pinots medal winners. I want to get my hands on the gold, double gold, and best of class winners for a blind tasting. I've never taken blogging about wine too seriously - you may have guessed this by the three postings in the last two years. While I'm always interested in promoting the great wine regions I am so fortunately surrounded by, the enjoyment I derive from blogging comes and goes. That said, I have never missed posting about a blind tasting, if only for future reference by my fiends who participated. 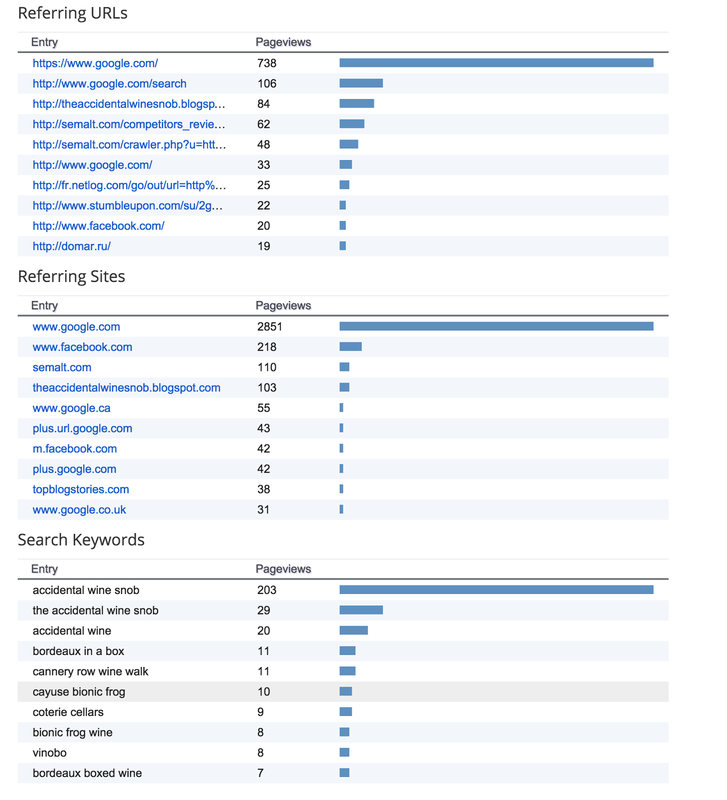 After my most recent posting, I took a look at the stats, just for grins. After almost 4 years, I've had 12,905 views. 2008 Cayuse "Bionic Frog" Walla Walla Valley Syrah came in first with 354 views. Bordeaux in a Box came in second with 245 views. Can I Get that Merlot in a Box? came in third with 221 views. Silvertip VINEYARDS came in fourth with 210 views. How to Plan a Wine Tasting Trip came in fifth with 153 views. Bionic Frog being #1 baffles me. After enjoying dinner, a splurge of prime and kobe Fred Steak from Schaub's, we moved on to the Cabs. We started by tasting the main event: The 10 year old beauty, 2005 Ridge Montebello, Bob and Caroline gave me for my 40th. It was truly a treat. We then moved on to an 'at your leisure' tasting of my best cabs. It should be noted that while everyone tasted, not everyone provided their ratings, including yours truly. I was disappointed not to find Jennifer's thoughts on this, given her affinity for Napa cabs. D - 2010 Frank Family Vineyards, Reserve, Rutherford came in first place with an average of 3.69. I picked this up on a Napa adventure with Dawn two years ago. This wine tasted fantastic then and even better now. They had an even better, more exorbitant Cab blend: The Winston Hill Reserve. Thanks Dawn for reminding me! If I ever return to the tasting room, you can bet I'll be looking for them both. 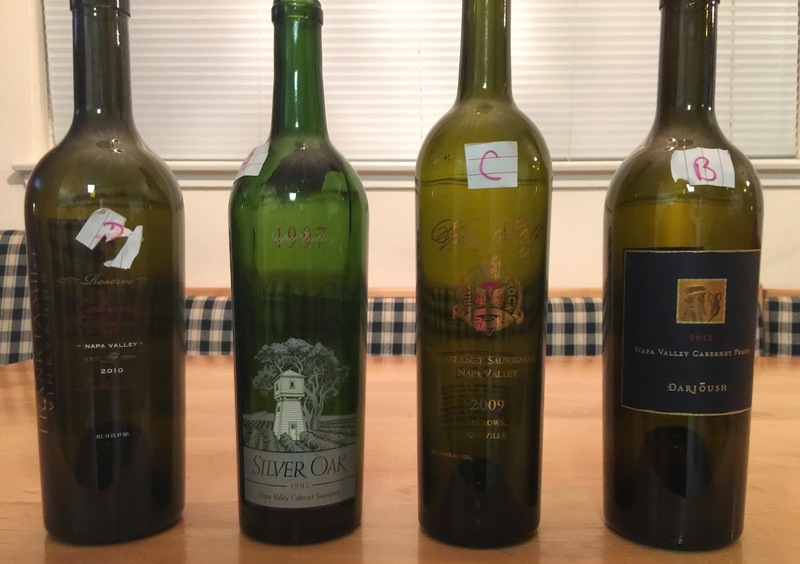 A - 1997 Silver Oak, Napa Valley came in a close second with an average of 3.60. Bob and CJ gave me this 18 year old masterpiece as well for some occasion that by no means warranted it. At this point you may be asking yourself who is Bob and how can I become friends with him. :) We are blessed with truly wonderful friends. Often they are far too generous. Whenever this generosity comes in the form of a bottle of wine, I always try and make certain the wine is enjoyed with them. Silver Oak is the first bottle I ever purchased over $50 at the first wine bar I ever went to courtesy of my good friend Ted. We tasted with a nice older couple. I remember the wife said her favorite wine was Opus One. I had never heard of this wine. Ted told me it was a silly expensive, overrated wine. C - 2009 Vine Cliff, 16 Rows, Oakville came in a third with an average of 3.26. At Ted's recommendation we toured Vine Cliff on our first real trip to Napa. It was a fantastic, beautiful, and informative two hour tour with just us and the wine maker. I will always remember it. It ended in tasting 4 wines: 2 white and 2 red. This is when I learned how expensive wine in Napa was. Winemaker: "That's our $85 Estate. You liked that, try this." Me: "Wow! That's even better!" Winemaker: "That's our $150 reserve"
At this point I felt I had to buy something, so I bought one of each of the reds. I'm not picking on Vine Ciff's incredible wine. It's all that expensive in Napa. This was just my first experience with the pricing. At some point, When Wine Enthusiast gave the wine a 98. Ted and I bought one, betting who would open it first. I paid Ted the $20 I owed him to serve this wine. B - 2011 Dariush, Napa Valley Cabernet Franc came in a last with an average of 2.66. We picked this bottle up on our last trip to Napa. The Dariush cab will always have a special place in my heart after the Return to Napa Cab Tasting. I'll never forget opening up #1. I still can't believe it was an Opus One that beat the Dariush; what a wonderful gift to share. I was shocked to read the bottle the next day and discover that this was the Cab Franc instead of the Cab I had intended to use. Doh! I'm going blind in my old age, that and their bottles look very similar. This wine was also too warm, which was unfair to it. It was incredibly chocolatey too. 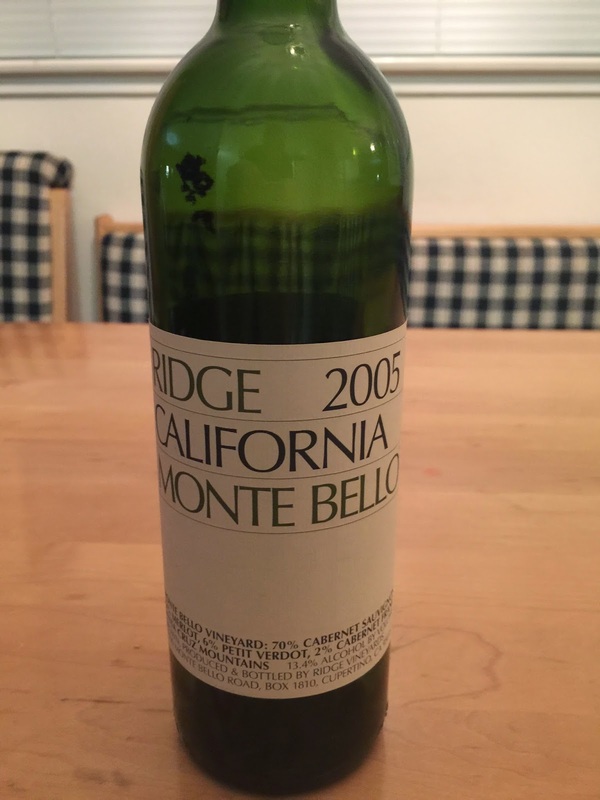 For my 40th birthday, our dear friends the Fosters gave me an incredible gift: A 2005 Ridge Montebello. I had tasted Montebello once before at Ridge, but never imagined owning one. Bob told me to cellar it for 5 to 8 years. After 5 years, I figured it was ready to taste, and I vowed to bring my best wines to taste alongside it. Anyone that knows me must be shocked to read I actually cellared something for 5 years. My good friend Ted regularly offers to store my special purchases, knowing I'm apt to open them prematurely. The first time I bought a case of futures, I don't think any of them survived to the recommended age of 3 years. But after wasting a good number of bottles, I've mostly learned my lesson. We started the tasting with another bottle Bob and Caroline had given me for one of my birthdays: A 2007 Marcassin Pinot. I had never heard of this exquisite, rare wine made by Helen Turley until Bob put it in my hands. After reading about its scarcity, how hard it was to get on the list, and seeing how exorbitantly priced it was directly (let alone on auction) I tried to return it. Bob, of course, wouldn't have anything to do with it. I tried to open it on a couple of previous occasions when the Fosters were around, but could never muster the courage. After breaking the cork (doh) I strained it into my best decanter, and let it sit for 2 plus hours before we all enjoyed this incredible treat. We then went on to an "at your leisure" Pinot blind tasting of the best my cellar had to offer. All of the Pinots were allowed to breathe 2 plus hours. B - 2012 Kosta Browne, Russian River Valley came in first place with an average of 3.30. We first experienced this wine in Las Vegas at Aureole; it’s a great restaurant, but the attraction was the 3 story wine tower with angels that fetched wine in a Mission Impossible-esque way we had seen on TV. We were seated in the swan room and were only able to see the tower in action from the outside and on the walk in and out of the restaurant. On the up side, we did have a swan swimming just outside the window. 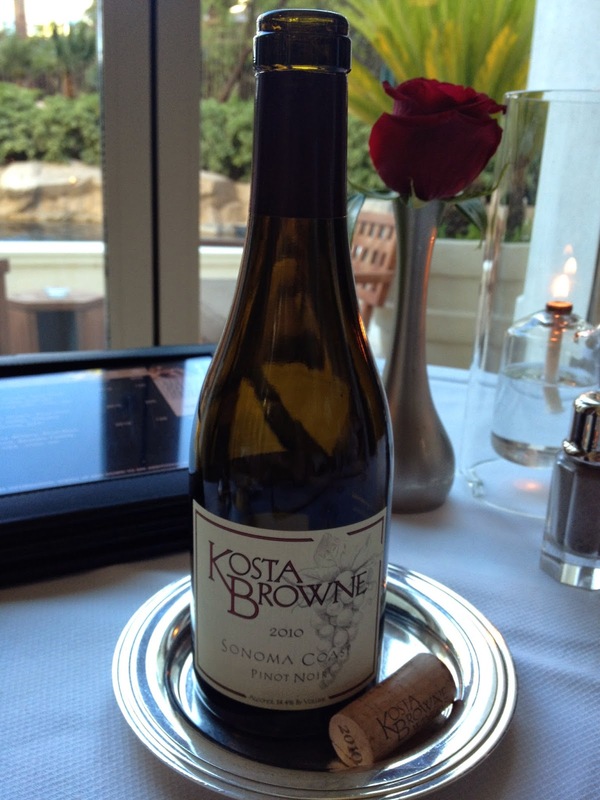 I was attracted to Kosta Browne on the iPad containing the wine list due to its mention in a couple of "Best California Pinot" searches I had done when looking for places to go. After the half bottle we enjoyed there, we joined the waiting list, and currently purchase the maximum number of bottles a year they allow us to purchase - four. D - 2012 Halleck Vineyard, Estate came in second place with an average of 3.29, a virtual tie (TM) for first. We encountered this winery on our first trip to the Russian River. It was available by the glass at Stark's Steak & Seafood, a recommended steak house we walked to that was literally on the other side of the tracks from where we were staying. While enjoying a great steak, "Potato Skin" fondue, and truffled french fries, I discovered one of my favorites, the Three Sons Cuvee Pinot. That same night, Sue discovered one of her favorites, the Sapphire Hill Pinot. All Halleck wines are treats in our house, but a bottle of the Estate is a once a year (if that) celebration. A - 2012 Patz & Hall, Pisoni Vineyard came in third place with an average of 3.11. Ted turned us onto this winery; their Sonoma House was our last stop on our Wine-Train-gift-certificate-inspired adventure to Sonoma and Napa last year. We joined the winery so that Ted could get some Pisoni - it's only available in limited club allocations. We enjoy the wine too, but mostly I blame Ted. :) They offer a billion Pinot and Chard varieties, so you can't help but find some you love; so far it's been an exercise in cellaring. C - 2012 Thomas Fogarty, Rapley Trail, Henry Ayrtons’ Block, came in last place with an average of 2.22. We were tricked into rejoining Fogarty when they informed us that, while getting their records in order, they had discovered that we never received a club shipment we paid for a number of years ago. While picking up the the shipment, they plied us with all sorts of great wine, "tricking" us into rejoining. We encountered the Henry Ayrtons at a special tasting with the wine maker and owners at Fogarty. At this point you no doubt realize that the best of my cellar is way too young, and you probably question if I've actually learned to cellar anything at all. You'll just have to take my word for it. I'm going to cellar one of each of these to try again in two to three years.